You would think there were hundreds of different types of vinyl siding out there, but there's not! 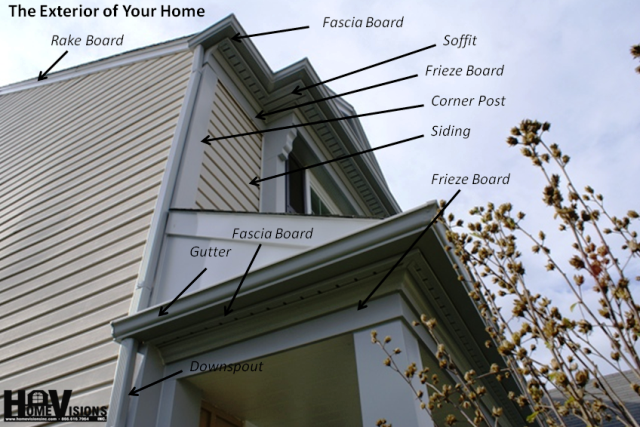 There are really only three different types that most siding, both wood and vinyl, fall into. Types of vinyl siding can be broadly broken into three categories or types. Siding is generally thought of as long thin planks of wood nailed either horizontally or vertically onto the house. Or, it could be small 'shingles' or 'shakes' that are individually nailed onto the house. Vinyl siding is manufactured to look just like wooden siding, so all the popular wood siding types and styles are represented in vinyl. 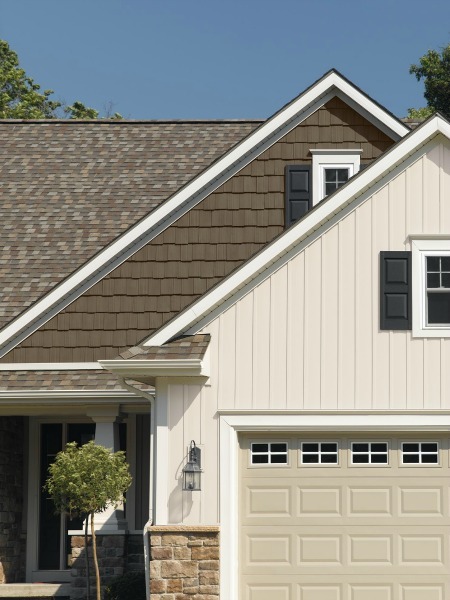 People use several different types, styles and colors of vinyl siding on their homes to create a special looks. Here the owner has used several different types of vinyl siding on the house to create his taste. 'Horizontal' or 'clapboard' siding on the main house, with 'vinyl cedar shakes' on the top gable ends. White half-round shingles used for accent. 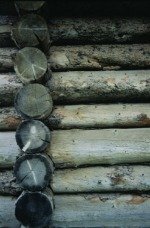 Great look at half the cost or maintenance of real wood siding. And you never have to paint! Choosing the right look for your house is all about the creative use of the different siding options. Homeowners often choose several different types, styles, colors, textures and trim to create a distinct look. Look at each type and image what it would look like on your house. 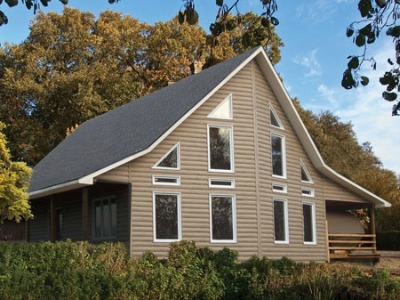 Within each Type of siding, there are usually several different Styles. Example: 'Clapboard' is a horizontal siding that runs across the house end to end, or horizontally. It comes in many different Styles such as, dutch-lap, beaded or smooth lap. And each of those come in many different textures, lengths, thickness and prices. Once you zero in on what you are wanting, you contractor will help you pick out the best ones that fit your house and budget. 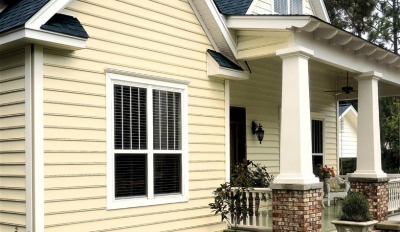 Beaded Clapboard is a popular style of horizontal siding. Each panel has a rounded grove or notch that runs along the bottom of each panel giving it a unique shadow line. 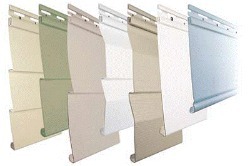 To see more information on beaded vinyl siding click here..Beaded Vinyl Siding. Vertical siding is siding that runs up and down on the house. This siding is called Board and Batten siding. 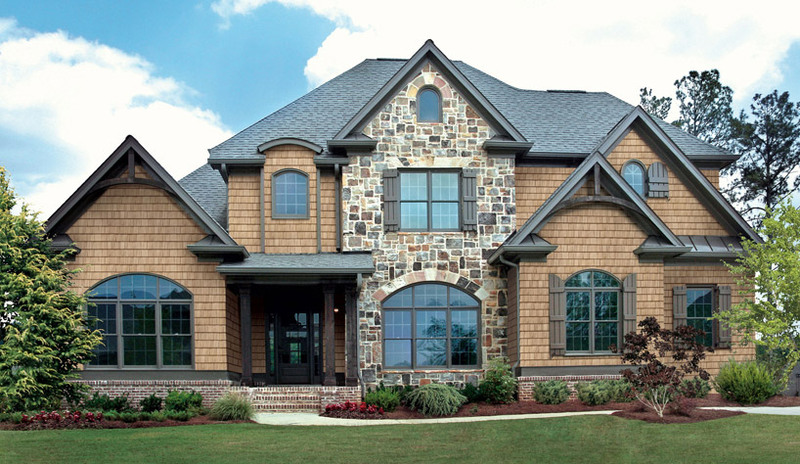 Here Board and Batten Siding is used as an accent on the homes, and it adds a very distinct look. 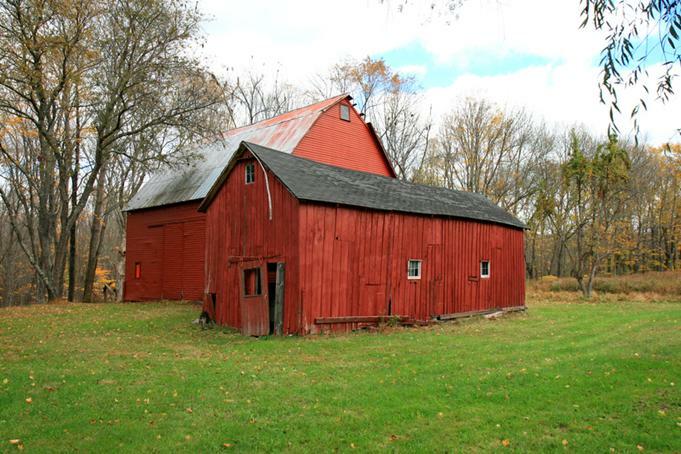 Board and Batten siding is sometimes called 'Barn Siding' because it was used on barns all across the U.S. for centuries. There is nothing that gives a home that warm rustic outdoor look like cedar shakes. Made to look just like real cedar wooden shakes. Vinyl cedar shake looks like real wood but without the high maintenance and up-keep of wood. It will not rot, never needs painting and termites won't eat it. Just wash it down once or twice a year with the garden hose and you will have that charming look for a lifetime. Some premium brands of vinyl cedar shakes are wind tested to withstand hurricane force winds making it a good choice in areas where harsh weather is a concern. 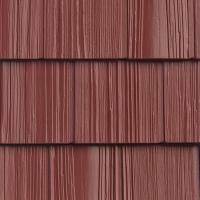 To see more information and pictures of Cedar Shake Vinyl Siding...click here. To see more pictures of homes using different vinyl sidings visit our pictures page...Pictures of Homes Using Vinyl Siding. 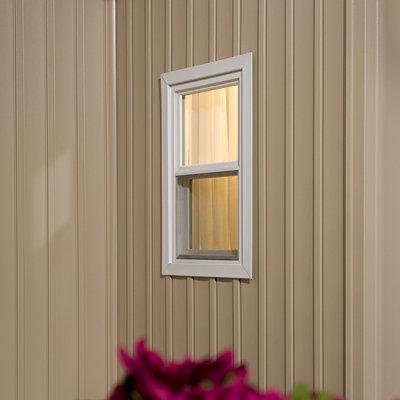 One of the most energy saving types of vinyl siding is the 'insulated' ones. Lowering energy costs has become a big deal now. Most people use insulated siding when it fits the budget or attach foam insulation directly to the exterior walls to help cut energy cost. Most Premium grades of vinyl siding comes in insulated versions. These sidings have foam insulation factory applied to the back side of each piece of siding. This foam insulation greatly increases the "R" value of the exterior walls and helps cut energy costs over the years. Insulated siding costs a little more than regular siding but will make up the difference in the energy savings over the years. 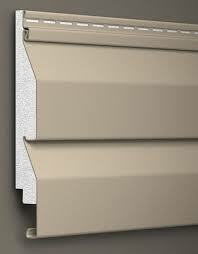 Insulated vinyl siding is also more rigid than regular siding and looks better. You can cover all the exterior trim so you never have to climb up a ladder and paint again. 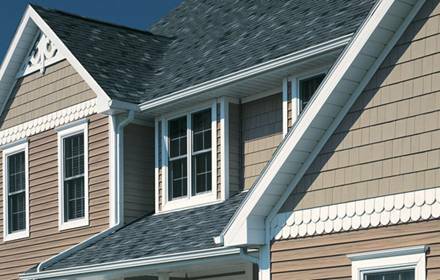 One of the most important elements of installing new vinyl siding on your house is the ability to cover all the exterior trim which never needs painting. Corners, overhang, window and door frames. These are sometimes referred to as the 'Trim'. It is usually extra and not included in the quoted price. All these areas need to be covered in color coordinating product so you do not have to paint anymore. It is the trim that gives the house that finished look. It is very important part of the project and you should buy the very best product that fits your budget. Always ask the contractor what is included and what is not included in his price. 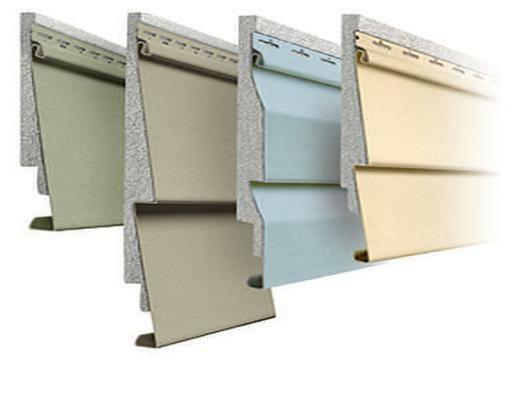 To see more information on Vinyl Siding Trim click here. Vinyl is strong, inexpensive, will not rot, never needs painting and is easy to clean with a garden hose. 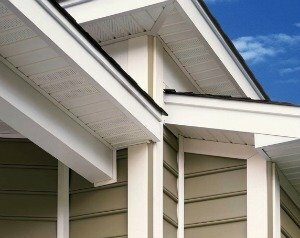 To see more information on the different 'Styles' and types of vinyl siding click here...Vinyl Siding Styles. Vinyl log siding is a product that looks exactly like a log cabin without the cost and high maintenance of real wood. 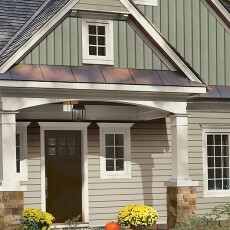 Vinyl log siding takes the homeowner back to Colonial days with a modern twist. Less cost and maintenance. Vinyl Log siding offers the homeowner all the rustic outdoor looks of a real log home without the cost or high maintenance of real log homes. Never needs painting and termites won't eat it! Click here for more information on Vinyl Log Siding. The first colonist cut down trees and made log cabins to live in. Soon they began to cut down a tree and saw it into many long narrow boards. They used the boards as a siding to cover their houses. This 'siding' kept the harsh winter winds from blowing between the cracks of the logs. This was a major milestone in building homes. More about the History of Siding click here.